Visual Hockey © 2008 Visual Sports Systems. Visual Hockey was designed to provide the most realistic and advanced hockey simulation experience possible. Visual Sports Systems has worked with NHL players to create a unique combination of video and animation processes that simulate real player and goaltender movements. 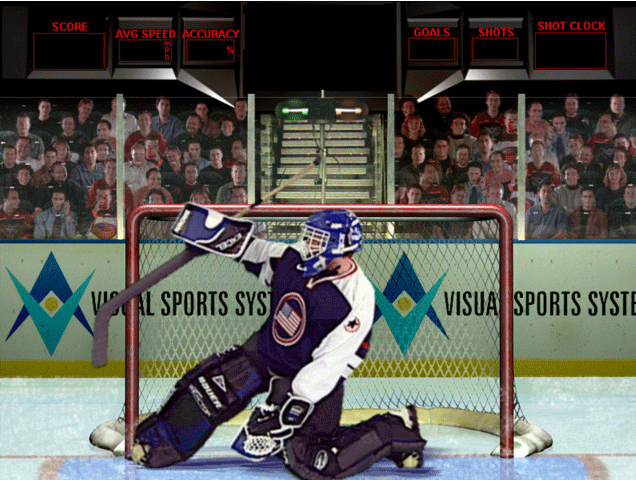 Players can test their shots against life-size goaltenders on life-size nets in a simulated environment. Players can also test their shots on corner targets, and be tested on their speed, accuracy and reflex time. A graphic display of all the shots taken, their location, and their result (goal or no goal). A summary scoreboard as above for both the 'Shooting on the goaltender' session and "Target shooting" session if applicable. The VisualHockey Training Database Features also records team and player information, tracks player performance over time, and reports on player performance trends with a number of statistical and graphical outputs.